Mitigating the Effects of urbanisation on Nature in Africa’s development By Femi Tunde Okunlola – Royal Times of Nigeria. In 1972 following the United Nations Conference on the Human Environment in Stockholm, Sweden between the 5 th to the16th June, serving as the first international conference on environmental issues, the World Environment Day was inaugurated. In its wake, tracking the improvement in the progress of our management of the environment has not been without its challenges over the years, especially in view of the growing trends of urbanisation and Industrialisation which over the past half decade has seen a surge, with more calls being made by activists and global leaders to rise up to the task of preserving the earth. The theme for the 2017 celebration is “Connecting People to Nature”. The preservation of nature in the wake of our fast changing world in view of human advancement is certainly worth pondering. According to the report of 2014 of the Department of Economic and Social Affairs of the United Nations Secretariat, about 56 percent of the world population has been urbanised; a drastic improvement from the scenario in the 1970’s when the percentage was a mere 30 percent. Future projections hold that by 2050, the percentage of the world’s urbanised population would be pegged at 66 percent, leaving 44 percent of the rural population. The growth of the world’s population is also projected to add 2.5 billion people to the urban population by 2050, and 90 percent of this population will be concentrated in Asia and Africa. The bottom line is that the world as we know it is fast changing and begs the question of how we have been creating a sustainable future. The term urban has not been universally agreed upon, as there are several depictions on the topic, and seeing as explanations vary across continents. However, simply put, the term urban refers to a densely populated area, which has its natural habitat geographically altered, with a surge in industrialisation, and whose economy isn’t basically an agrarian dependent one. The presence and dependence on infrastructure is also basic in this description. The term urbanisation simply refers to the processes involved in developing an urban area. The urbanisation process can be dated to centuries back, with the earliest cities emerging in Mesopotamia, Egypt, China and Latin America, in modern times, the most highly urbanized countries are Belgium (98 per cent urban), Japan (93 per cent), Argentina (92 per cent) and the Netherlands (90 per cent). Africa and Asia are urbanizing more rapidly than other regions of the world. (Department of Economic and Social Affairs, United Nations,2014). The rate of urbanization, measured as the average annual rate of change of the percentage urban, is highest in Asia and Africa, where currently the proportion urban is increasing by 1.5 and 1.1 per cent per annum, respectively. According to the United Nations, Africa is currently urbanizing faster than in the late 1990s and is expected to be the fastest urbanizing region from 2020 to 2050. Urbanization in developing countries has proceeded faster than in developed countries, but the correlation of the rate of urbanization with economic growth has been weaker than in developed countries. With urbanisation has come a lot of human interaction with the environment, and hence the threat of human activities has impacted greatly on nature, in man’s competing for water, energy, air, and food. Most African countries are still lagging behind in doing a good job of keeping a balance and inculcating natural elements into nature. The urbanization of Africa’s population has been predicted to cause an increase in aggregate energy use, despite efficiencies and new technologies, which is likely to have disastrous environmental effects. It is also estimated that in sub-Saharan Africa, the urban fertility rates are about 1.5 children less than in rural areas and urbanization is likely to slow population growth. The afore mentioned fact doesn’t come as a surprise considering the environmental degradation and rising number of slums on the continent, amongst them being Makoko (Lagos, Nigeria), Kibera (Nairobi, Kenya), nima (Ghana) etc. The congestion in the areas have seen a competition for resources, which has given rise to the pollution of water, air with industrial development (Niger Delta region of Nigeria a case study) and in some cases diseases, due to inadequate resources, all leading to a low life expectancy. While urbanisation cannot be retarded and the world will see an even faster trend, it is important that the world, especially African governments pay attention to climate change issues, global warming and adaptations which favour nature as well. The concept of garden cities proposed by Ebenezer Howard in his work published in 1989 Tomorrow, A Peaceful Path to Real Reform kicked off and revolutionised the way cities were being built. Built upon by several other innovators, this has become a standard model for adapting nature to urbanised settings, especially in cities where high rise buildings tend to be prevalent. While emerging cities in Africa like the Eko Atlantic which is soon to be completed have adopted this approach, government can be more reactive as well to already existing platforms by introducing policies of tree plantings, tree replacements where trees are felled etc, and where appropriate, begin considering the options of green areas/ gardens on the ground, or gardens on the sky. Recycling of non perishable products is also an alternative rarely explored by most African countries. The fact that the continent sits on a million dollar industry of recycling is a distressing fact in itself; as waste is a product the country has in abundance, but yet shows certain cluelessness in its management. Zero waste policies can further help mitigate urbanisations effects on nature. Also, it is important to note that while movement migration from rural areas cannot be stopped, it can be controlled somewhat by ensuring that an inclusive approach is taken when it infrastructural development and the creation of jobs in the areas which remains one of the reason for the influx of rural dwellers into towns. This may help control the population density in urban areas. While there are many options that can be explored in slowing down the negative effects of Urbanisation on nature, perhaps the most important remedy is implementation and a strong will by African governments, and a better advocacy for environmental preservation, as the glaring eventualities of man’s impact on the planet, begs the question of how sustainable the development and advancement we make really is, and what world exactly, we will be leaving future generations. 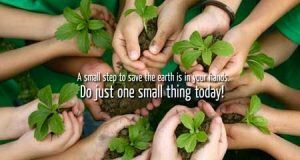 This is food for thought, even as we commemorate another world Environment Day on the theme “Connecting people to nature”, and while we raise awareness about the environment. Femi Tunde Okunlola is a Development Broadcast Journalist and Writer from Nigeria, covering Africa, with a focus on Governance, security and Environment. He holds a Masters degree in Peace and Development studies, and is an Obama YALI RLC Fellow, and RNTC Netherlands Alumnus. Tweet @iam_fto , E-mail: tundeenglish@gmail.com.